A 145 m long pit leads to the entrance of the cave at the altitude of 642 m above sea level; 230 metres of its total length of 300 m is now accessible to public (seeing it takes 30 minutes). 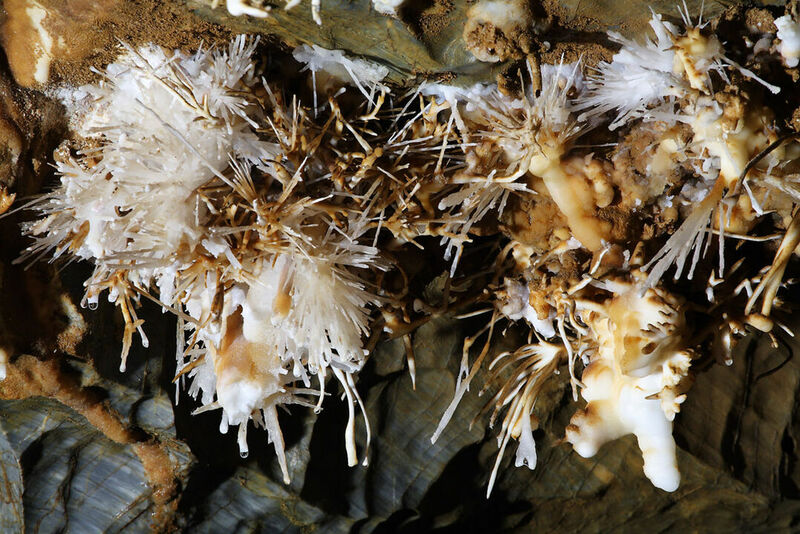 It is obvious that it is not a large cave, but it is all the more rare and valuable for its aragonite ornamentation (the form Srdce Hrádku is famous), the only of the kind in central Europe. There are not many similar caves in the world either. The Ochtinská aragonitová cave was discovered in 1954. The rich and varied needle, spiral and kidney-shaped aragonite filling similar to sea corrals creates an unusually varied mixture of images. The Hall of Milky it the part of the cave, which is unanimously, considered the most beautiful. The white aragonite grapes in a fissure in the ceiling glow like stars on the sky and the equally snow-white “bushes” intrigue any visitor. Penzion pri Kastieli Betliar is set in the vicinity of Kastiel Betliar, one of the most known castles in Slovakia and it is provided with a restaurant. Free WiFi is available throughout the property.